A cystic form of hidradenoma, usually apocrine. 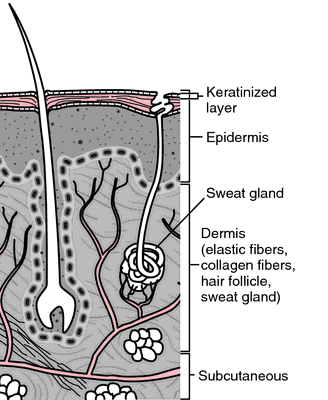 1. a retention cyst of a sweat gland. n a cystic form of sweat gland adenoma. A hidrocystoma is produced by the cystic proliferation of apocrine secretory glands. It is not uncommon, occurring in adult life in no particular age group, with males and females equally affected. The most common site is around the eye. Hidrocystomas are cured by surgical removal. a retention cyst of a sweat gland. Associated syndromes: The inherited disorders that are most commonly associated with the presence of multiple eccrine/apocrine hidrocystomas are Goltz-Gorlin syndrome and Schopf-Schulz- Passarge syndrome. Graves' disease has also been associated with multiple eccrine hidrocystomas, possibly due to hyperhidrosis, which is seen in hyperthyroid patients. Differential diagnosis: Eccrine hidrocystomas and apocrine hidrocystomas have a very similar presentation, and their distinction from other head and neck cyst-like lesions must ultimately be verified on biopsy and by careful examination under the microscope. Management: The most common approach to the treatment of hidrocystomas (eccrine and apocrine) is simple needle puncture. Finally, avoiding hot temperatures or humid conditions will help prevent worsening of symptoms in patients diagnosed with eccrine-type hidrocystomas. CONCLUSION: Hidrocystomas are benign cystic lesions that typically occur in the facial region. The efficacy of electrosurgery and excision in treating patients with multiple apocrine hidrocystomas. Hidrocystomas in the periorbital region are often located in the eyelid and inner canthus. Hidrocystomas do not recur if total excision is achieved. Our aim in this study was to emphasize that eccrine hidrocystomas, although rare, should be considered during differential diagnosis of orbital masses. Multiple eccrine hidrocystomas treated with glycopyrrolate. Multiple eccrine hidrocystomas - from diagnosis to treatment: the role of dermatoscopy and botulinum toxin.